I am amazed by Imran’s style of writing. 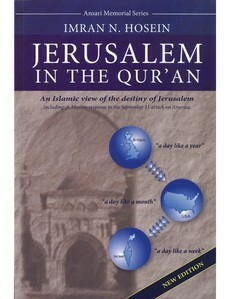 Though Jerusalem in the Qur’an, is a meticulously written thesis combining religious and historical documents with recent political events and penetrating interpretations from the Qur’an and Hadith, it runs like a story. Once you begin reading it, it is hard to stop. This is the general quality of a novel. The person would read it once and throw the book away - but not that of a serious thought-provoking dissertation like the book that Brother Shaikh Imran published. It is a reference that one needs to keep and reread whenever the subject is to be researched. I believe that this eloquence of the Shaikh must be the result of a natural gift that has interacted with his indefatigable work as a preacher and da’iyah and the Divine Blessings for his sincerity. Udgiver: Masjid Jamiah, City of San Fernando, Trinidad Tobago.